There is a cold, clinical feeling to Martha Friedman’s recent body of work, titled “Castoffs,” comprised of several dozen multi-media pedestal sculptures. The Brooklyn-based director of visual arts at Princeton extends her interest in the male figure from her 2017 video, “Tangle,” featuring a dancer suspended over metallic structures. 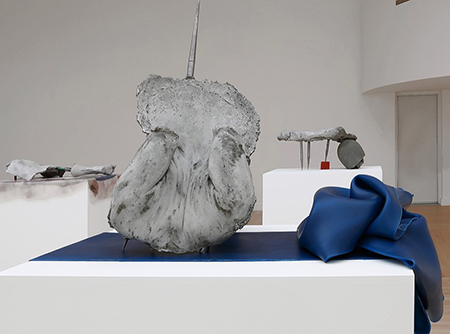 These sculptures, which use cement, plaster, glass and ceramics to mold body parts, fit them in and around the pedestal top, tipping and tilting over its edges in disturbing juxtapositions of anatomical dismemberment and dislocation. Using industrial and studio materials as surrogates for body parts and internal organs, Friedman extends the performative creepiness of Matthew Barney into more austere, even elegant, conglomerations with whiffs of surrealist assemblage: Intestines become pipes. Rubber tubing and spikes are surrogates for circulatory systems and hair. This time the groom seems stripped by his bridesmaids, with apologies to Marcel Duchamp. Figurative without the figure, performative without a dancer, these “Castoffs” use multiple surface qualities — hairy, gooey, shiny — as possible metaphors for emotional states without recourse to expressionistic handling. With drab colors throughout, excepting the occasional flash of plastic color, Friedman has created a tour de force that fills the largest exhibition hall with rows of rectangular pedestals of uniform height, taller than normal, so we can examine each object, looking down upon and into it, as if the sculpture were an anatomical or necrotic specimen. Unlike other artists who resort to abstracted figuration, Friedman resists the literalism of flesh colors or attractively bulging curves. Instead mystery, enigma and an ambiguous aura of danger and becoming permeate the space.